When I was pregnant and told people that I was using a doula, the majority of those I told had no idea what a doula was. Interestingly, however, every lesbian knew exactly what I was talking about! 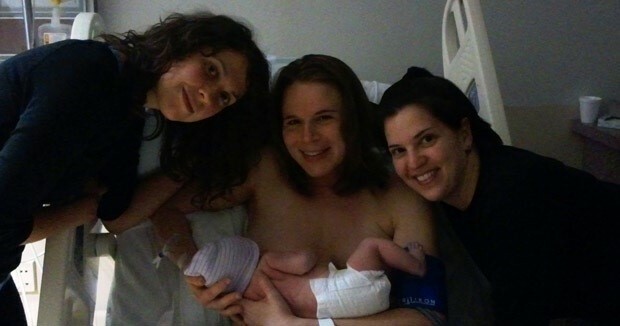 It’s no mystery why lesbians are drawn to doulas. I mean really. Stereotypically we are talking about an alternative, new age, crunchy, granola, au naturale, woman-body-part loving, flowy skirt-wearing, vegetarian, organic food-eating profession of lady lovers! How could we not love them? For those reading this who are thinking “What’s a doula and why do lesbians love them so much?” let me try to explain this phenomenon. A doula is essentially a birth “advocate” of sorts. She (and I say she because I’ve never heard of a male doula but maybe they are out there somewhere) is somewhere in between your best friend who you feel totally comfortable walking around naked in front of, and your midwife or doctor. She does not have all of the degrees that a midwife would have but knows a heck of a lot about all things labor and delivery. She does not deliver your baby, or even do exams of any kind, but she is there for you, for whatever you need, including stuff a doctor would never dream of doing for you. For example, my doula literally held my hand through more than 25 hours of contractions. Even on no sleep, she supported me — mentally and physically — lifting me from the bed to birthing ball to bath tub and back again. She brought me ice chips, held the bucket I vomited in (yes, it was a bad labor!) and massaged my legs and sore back. Perhaps even more importantly, she kept my partner sane, making jokes and explaining medical terms the doctors would throw around. For many lesbian couples, a doula is even more than all I just described. Sometimes we just need one more person on our “side.” Someone to do all of the doula duties but also someone to speak up to the doctor who might ask if the daddy will be cutting the cord or treat the non bio mom like she’s just a spectator in the room instead of the parent. Some lesbian couples want a doula to be a barrier between the non bio mom and any doctor who might be stupid enough to make a comment that might get him punched in the face by a stressed out sleep deprived (but oh so loving) partner! A doula can do all of these things. She is you and your partner’s advocate through and through, from planning your ideal birth scenario to picking up the pieces if your perfect plan doesn’t go…well, according to that plan. And when all is said and done you can go out for a nice cold acai and wheatgrass smoothie together to celebrate! Made with organic almond milk, of course.